Beverage Wholesaler - September 24, 2018 To view this email as a web page, click here. The 2018 Beer Growth Brands look back at what brews sold best in 2017, a year when the category again slipped slightly. Certain parts of the industry lagged. Macro brands continued to recede. Modern consumers, ever adventurous, experimented across microbrews and other beverage categories. Craft beer also hit more headwinds. 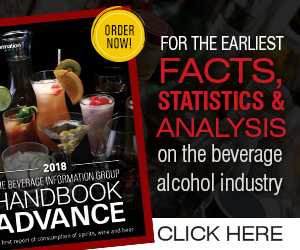 This was due to oversaturation, as new brands and brews flooded the market, plus increased competition from wine and spirits. Although still growing, the craft craze has undoubtedly slowed. Fall is upon us, which means Buffalo Trace Distillery will soon release its annual 2018 Antique Collection of whiskeys. The collection will once again feature five limited-release whiskeys of various ages, recipes and proofs, with one notable change: Eagle Rare 17 Year Old Bourbon will now be 101 proof. After 635 days of losses (and a tie), the Cleveland Browns achieved their first win in nearly two years last week, unlocking coolers across the city full of free Bud Light as a result. Bud Light installed the "victory fridges" at bars throughout the city in August, pledging to unlock them if the Browns won a game this season. Requirements: Ideal candidate for this position will be responsible for the business development of major corporate customers, analyzing current and potential account business.